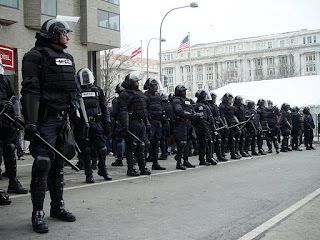 All states are police states from the start because they require force through police to implement their edicts. The question is of what level or degree of a police state. Because they have the guns and the belief of authority, the cooperation of the sheeple, government serves it's interest in increasingly stringent authoritativeness and capability. It naturally grows into a bigger monster until it has nothing left to control, feed from or destroy.